Why are you asking for my email? How do I change my email address? You need to register a working email address in your profile. Please use a real address that you check. We will not spam you, and we will not give out your address. (Only site admins can see it; they can also see the email address you used when you signed up.) We use your profile email address to send password reset emails, reply to messages you send through the Contact Form, or contact you about specific site matters. By default, your address is hidden from everyone else and not shown on your user-facing profile page. Only if you set your preferences to show it, will your email address show up in your profile -- and even then, it only shows to registered logged-in users. Being contactable by other users can sometimes be advantageous. Many members use a semi-disposable address for MetaFilter only so that people can contact them. You can use MeFiMail for contacting other users and being contacted if you don't want to have a user-facing email address. You can edit your email address and the rest of your profile details by clicking on the preferences link at the top or bottom of the page when you are logged in. Can I have more than one account? Can I change accounts? The guiding principle here is that we expect you to have one main identity on the entire site, at a given time. It's not okay to pretend to be multiple people. Lots of detail in this MetaTalk post. - If you need to move to a new account name, it is okay (in most cases) to open a new account and close the old one. Often people will note on their userpage who they used to be, but it's not required. Note, this kind of account switch was allowed as a courtesy for people who felt strongly that their old name wasn't okay anymore, but it should not be abused. Contact the mods if you have questions. - Some previously banned users may be allowed to open a Brand New Day (BND) account. This is only okay if the new account is not causing the same problems as the old account. Please contact the mods if you are unclear on this. - to get around the time limitations for AskMe, MeFi and MeTa posts. The time limits are per-person, not per-account. People who violate the rules for sock puppet accounts will risk losing the sock puppet account, getting a time out on their main account, and/or having the relevant questions, posts, or comments removed. While moderators generally know which accounts are sock puppets, they will not reveal that information to users. That said, it is the responsibility of the user to maintain the privacy of that account if they want it to remain private. If your behavior with a second account is problematic, the mods will close that account if you do not curtail the problem behavior promptly yourself. Ask a moderator if you have questions about when it's okay to have a second account. I want an account but I don't want to use PayPal. What do I do? There is no self-serve way to get an account without using PayPal. You can contact the mods if you want to try to work out alternate account payment arrangements. Can I close or delete my account permanently or temporarily? Yes; if you no longer want to be a part of the MeFi community you can close your own account. If you go to your profile page when you are logged in, click Edit Profile and scroll to the bottom, you will see a link that says "Close Your Account." Clicking this will take you to an "Are you sure?" page. If you confirm, your account will be closed and you will be unable to log in, post, comment or access MeFiMail. Your existing posts and comments will remain. If you change your mind at a later date and want to reactivate your account, an admin can do it for you. Who can see the information on my profile page? What's the "minimal" profile option? Short answer: profiles are mostly visible to the public, but non-indexed (that is, not "visible" to search engines like Google). Your Full Name, Picture, Webpage, and Blurb are visible to the public, and by default the profile-page listings of your comments and posts and contacts are too. Among the user-editable parts of the profile page (where you choose what information to enter), the visible-to-the-public items are those under "Personal Info": Full Name, Picture, Homepage URL, and Blurb about you; and optionally, Social Apps. The visible-to-members-only items are: Email (required; private by default, but you can choose to make it visible to members), Location, Geographic Coordinates (members-only by default, but you can choose to make them private), Occupation, Gender, Relationship Status, Birthday, IM, and Social Apps (you can choose whether to make Social Apps visible to the public or members-only; older accounts default to 'public', new accounts default to 'members only'). The members-only fields have a dark background on the Preferences page to make it easier to remember which they are. Except for Email, all the user-editable fields are optional, so for maximum privacy you can simply leave them blank. For email, you must include a working email for moderators to reach you at, but it's only displayed on your profile page if you choose. Among the site-generated parts of the profile page, everything is visible to the public by default: Join date, Funding message (unless you choose to hide it), Listings of your Contributions (posts and comments), Favorites, Social connections (contacts), and Tags. With the "Minimal Profile" option, members can hide the profile-page listings of Contributions, Favorites, Social connections, Funding Message and Tags from logged-out readers. To do this, check the "Minimal profile for non-members?" option under "Contact / Privacy Preferences". Note: this doesn't hide your actual posts and comments themselves - those remain visible to anyone on the internet. It only hides the listings on your profile page, and only hides them from non-members. Regardless of what's visible to human readers, Metafilter profile pages are set to be "non-indexed", which means reputable search engines will not make their contents searchable. For this reason, please don't bring profile information over to the main part of the site, where it can be indexed by Google; doing so is potentially a bannable offense. This MeTa comment discusses a little more about the ins and outs about what you should and shouldn't do with information you get from people's profile pages. Can I publicly mention details from someone else's profile page? Generally, no. 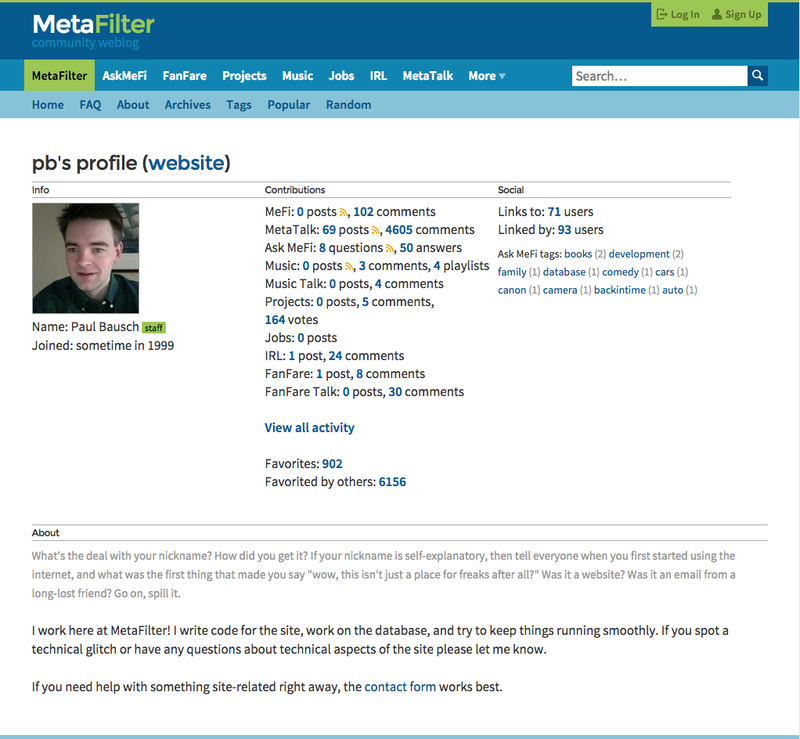 User profile pages on MetaFilter are not indexed by Google. This means if someone's profile says that they live in a certain city or gives their real name, that information is not considered "public" on the site. More details here. How do I post an anonymous question in AskMe? Is there a function for anonymous follow-ups? The anonymous posting form can be reached from the "New Question" page of AskMetafilter. When you use this form, your question goes into a queue that is only read by the admins. It will have to be approved, so it won't be posted immediately. Generally questions are approved (or not) within 48 hours. Not all anon questions will be posted, but most will. If you are wondering about a question you submitted a few days ago, it is fine to ask an admin about it. Your posting is not linked to your username in any way in the MetaFilter database; anonymous questions are posted through the Anonymous user account. However, the admins can ascertain who posted the question if they need to. Anonymous questions are for basic privacy, not for hiding from Interpol. You can read more about how the AnonyMe mechanism works in this thread. Questions about illegal activities are unlikely to be approved. Questions whose only answers are "see a doctor" or "see a lawyer" are unlikely to be approved. Questions about ordinary subject matter that doesn't seem to fit the needs of being anonymous may not be approved. Please do not ask questions about suicide or revenge. (If you are feeling suicidal, please seek in-person help. The ThereIsHelp page has a list of resources/hotlines.) We can not promise to keep your information confidential if we think you might harm yourself or others. There is no mechanism for following up anonymously, but the admins will post a follow-up comment to an anonymous question for you -- use the contact form linked at the bottom right of each page to reach the admins. Other MeFi users are often willing to do this too. Sometimes people set up disposable email accounts so they can be contacted about an anonymous posting. This feature is not intended to provide absolute anonymity, please do not use it if that is what you require. If you need to ask a question that's not associated with your main account, and you want to be able to follow-up by yourself, you are permitted to buy an extra "sockpuppet" account. Here are the guidelines about second accounts. We ask that people use the anonymous feature sparingly, not more than once or twice a year. If you feel you want to ask a number of questions separately from your main account, getting a second account may be a better solution. Is there a way to turn a non-anonymous old question into an anonymous one? We do have a way to anonymize old posts. Doing this does somewhat decrease the value of the questions to the community -- since people answered it with a user in mind and some answers may not make sense -- so it is not something we do lightly. However, we will anonymize old questions rarely, if it's important. Contact a mod if you want this done. Please do not ask questions under your real name that you plan to anonymize later. What is the Infodump? Does Mefi release other data for study? The Infodump is Mefi's regularly-updated published collection of site statistics. It includes a great deal of information about posts, comments, tags, categories, favorites, and user behavior concerning all of those. The Infodumpster was created and is run by user Combustible Edison Lighthouse. It is a convenient way to run searches on the information from the Infodump. Mefi has also released the MetaFilter Corpus, a collection of linguistic information which can be used to find things out about how language is used on the site, and how that use has evolved over time. Why are you asking for my gender/pronouns? The "gender and/or pronouns" field on the profile page is freeform and entirely optional. You can use it to let people know your gender and/or what pronouns you go by (such as she/her, he/him, they/them, or other terms). It's fine to leave it blank, or to specify both your gender and your pronouns, or to specify just one or the other. It's visible on your profile page to logged-in members only, although people may naturally use the info in conversations on public parts of the site. You can check another member's profile (by clicking their username) to see if they've stated a preference. Also worth noting: until 2017, the field was just "gender." Many members don't update their profile often, and may not have updated their entry in that field since pronouns were added. So if someone's entry sounds a little odd as an answer to "gender/pronouns", it might be an answer they entered to just "gender," and the field changed around them. MeFi Mail is a private messaging system for MetaFilter users and allows contact with users who may not have an email address in their profile. It is enabled by default but can be turned off in the profile editing area. Members can opt to have these messages sent directly to their profile email address. There is a little envelope on the header bar of each page of MetaFilter, next to your username. The little envelope will turn orange when new messages are received. To check your Mefi Mail, click the envelope; it will take you to your Mefi Mail inbox. To send someone Mefi Mail, go to their profile page by clicking their username. Members that have this option enabled will have a "send MeFi Mail" option visible on their profile page underneath their username that can be used to contact them. Users can also opt to block MeFi Mail. Users who have blocked MeFi Mail cannot send or receive MeFiMail and their profile page will say "MeFi Mail Disabled". To block all MefiMail in this way, go to your Profile editing page, and under Contact/Privacy Preferences, check "Opt-out of MefiMail". To block Mefi Mail only from a specific user, scroll to the bottom of a Mefi Mail from that user and click "Block this sender." If you have blocked a user and want to unblock them, you can do this from your contacts page at the bottom where it says "Manage blocked senders". HTML cannot be used in MeFi Mail messages but URLs on a line by themselves will turn into hyperlinks. Banned or time-outed users cannot use or access MeFiMail. Unless you have specific permission, reposting someone's MeFi Mail is a violation of site guidelines. Do not use MeFi Mail to harass or stalk or spam other users. Abusing MeFi Mail in this way can result in your account being banned. This was a feature that some users had requested and it is totally optional. You can indicate your birthday [day/month/year or just year] and your age will appear on your profile to logged-in users. If you decide you no longer want to make your age/birthday visible you can revert to having no birthday showing. You can click on your birthday in your profile and see which members share your birthday. How do I see if a user is online or not? You can't. 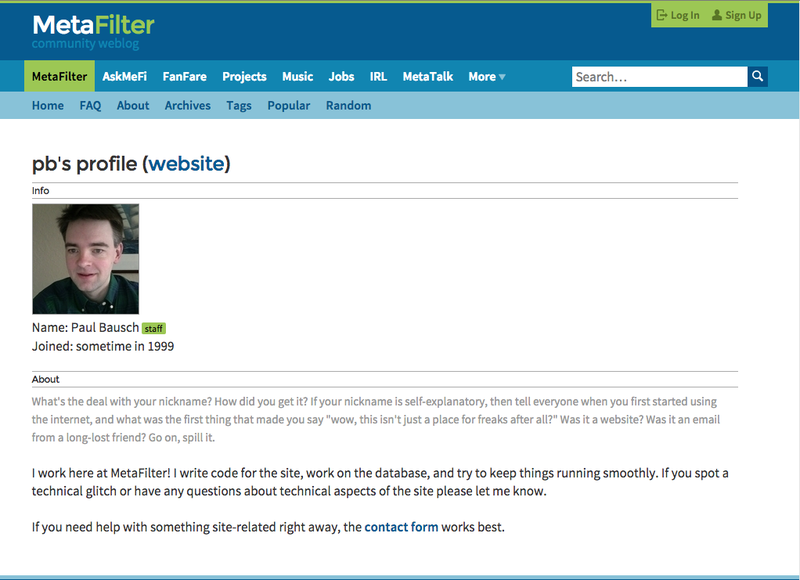 We don't have a feature in MetaFilter that will show when a user is online and using the site. Why are you asking for my geographic coordinates? It is entirely optional to give your geographic coordinates in your profile. If you give a longitude and latitude, you will be able to use certain features that are geolocation-based. These features include: seeing which other members live near you (you can specify a distance for "near"); getting a message if there is an IRL meetup scheduled near you; seeing how far away from you each job posting is in Jobs. You can choose whether other members will also be able to see your location by selecting 'Available to Members' or 'Private' in the Geographic Coordinates section of your site preferences. Flags are not anonymous. Users cannot see what has been flagged or by whom, but the moderation team can see which users are responsible for which flags.